The Scent: Zesty scents of orange, ginger + sea buckhorn help you power up, even before your morning cup of joe. Unless you're the type to bring your coffee in the shower. In which case, more power to you. 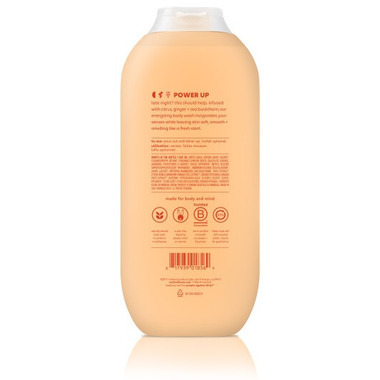 Ingredients: water (aqua), sodium lauryl sulfate, cocamidopropyl betaine, fragrance (parfum), polyglyceryl-3 laurate, glycol distearate, methyl glucose caprate/caprylate/oleate, propanediol, ammonium chloride, coco-glucoside, lauryl lactate, HIPPOPHAE RHAMNOIDES (SEA BUCKTHORN) FRUIT EXTRACT, CITRUS NOBILIS (MANDARIN ORANGE) PEEL EXTRACT, ZINGIBER OFFICINALE (GINGER) ROOT EXTRACT, glycerin, tetrasodium GLDA, glycerol oleate, glycol stearate, citric acid, ethylhexylglycerin, phenoxyethanol. Randomly picked this up. So impressed. Really nice lather Esp for a natural soap. Smells amazinggg. Reminds me of the smell of lush product. Def will be buying more. Refreshing and citrusy, like a creamsicle on a very hot summer day! Method products are #1 ! 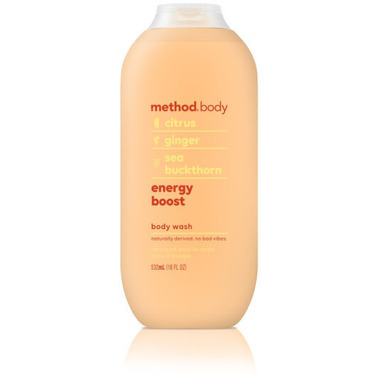 Nice refreshing scent, and I love the quality of all the Method body washes. I've used all types of method body washes for years and this is by far the best one!! Nice creamy lather, and the smell is SO GOOD. Love it!!! Excellent body wash! Generally impressed with Method products and this is no exception. Smells of refreshing citrus and produces a nice foamy lather.